I was raised with certain of the Chinese traditions throughout my childhood and into my adult life, but with no real explanation as to why things were done, what the meaning was behind the actions that many would call "superstitious." 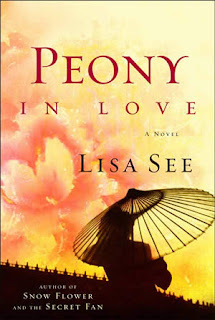 Until I read Peony In Love by Lisa See, which I finished this morning, I never had the insight and understanding that I do now - nor did I have much appreciation for it. Quite honestly, it all seemed like nonsense, practicing traditions like offerings to the ancestors, eating certain foods for certain results, etc. based on what? Faith? If the living haven't yet crossed over into death, then how the heck do we know what we need to do, how to make the transition between life and death better or easier for our departed loved ones? How did we come to this knowledge? It wasn't until my own father died that I started paying attention to these traditions, and asking questions into the meaning...especially when events occurred that I had absolutely no explanation for. Where things happened in my dream that carried over into my waking moments, physical sensations that didn't evaporate the second my eyes opened, and my mind became conscious....and more questions, when I no longer had those dreams, like "why?" Reading Peony In Love answered some of those questions, and yet raised new ones at the same time. The most troubling is the one that I continue to question. What do I believe about death? What affect do the living have on those that have died? I do know that once we decide what we believe then we tend to easily identify circumstances, events, situations, things, etc. to confirm those beliefs and more easily dismiss those things that contradict them. Regardless of what I was raised to believe of the Chinese traditions (which of course conflicted with my father's Midwestern Christian faith), this book was one of the most moving love stories that I have read in a long time. Beautiful!